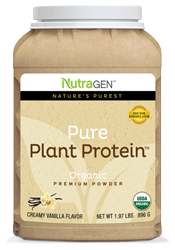 Pure Plant Protein™, by Nutragen, is easily digested and perfectly balanced with the cleanest, highest quality protein blend. It mixes well with Pure Greens™ and Pure Digestion Plus™ to create a delicious, nutrient dense, low calorie meal replacement shake. Pure Plant Protein is also Paleo-Friendly as it contains no grains…..only sprouts! Suggested Use: Blend, shake, or briskly stir two (2) scoops directly into 10-12 ounces of water or your favorite almond, rice, or coconut milk until fully dissolved.